For other uses, see Event horizon (disambiguation) and Horizon (general relativity). In general relativity, an event horizon (EH) is a region in spacetime beyond which events cannot affect an outside observer. In layman's terms, it is defined as the shell of "points of no return", i.e., the boundary at which the gravitational pull of a massive object becomes so great as to make escape impossible. An event horizon is most commonly associated with black holes. Light emitted from inside the event horizon can never reach the outside observer, and the outside observer cannot see beyond the event horizon. Moreover, any object approaching the horizon from the observer's side appears to slow down and never quite pass through the horizon, with its image becoming more and more redshifted as time elapses. This means that the wavelength of the light emitted from the object is getting longer as the object moves away from the observer. The travelling object, however, experiences no strange effects and does, in fact, pass through the horizon in a finite amount of proper time. More specific types of horizon include the related but distinct absolute and apparent horizons found around a black hole. Still other distinct notions include the Cauchy and Killing horizons; the photon spheres and ergospheres of the Kerr solution; particle and cosmological horizons relevant to cosmology; and isolated and dynamical horizons important in current black hole research. Far away from the black hole a particle can move in any direction. It is only restricted by the speed of light. Inside the event horizon all paths bring the particle closer to the center of the black hole. It is no longer possible for the particle to escape. One of the best-known examples of an event horizon derives from general relativity's description of a black hole, a celestial object so massive that no nearby matter or radiation can escape its gravitational field. Often, this is described as the boundary within which the black hole's escape velocity is greater than the speed of light. However, a more accurate description is that within this horizon, all lightlike paths (paths that light could take) and hence all paths in the forward light cones of particles within the horizon, are warped so as to fall farther into the hole. Once a particle is inside the horizon, moving into the hole is as inevitable as moving forward in time, and can actually be thought of as equivalent to doing so, depending on the spacetime coordinate system used. The surface at the Schwarzschild radius acts as an event horizon in a non-rotating body that fits inside this radius (although a rotating black hole operates slightly differently). The Schwarzschild radius of an object is proportional to its mass. Theoretically, any amount of matter will become a black hole if compressed into a space that fits within its corresponding Schwarzschild radius. For the mass of the Sun this radius is approximately 3 kilometers and for the Earth it is about 9 millimeters. In practice, however, neither the Earth nor the Sun has the necessary mass and therefore the necessary gravitational force, to overcome electron and neutron degeneracy pressure. The minimal mass required for a star to be able to collapse beyond these pressures is the Tolman–Oppenheimer–Volkoff limit, which is approximately three solar masses. Black hole event horizons are widely misunderstood. Common, although erroneous, is the notion that black holes "vacuum up" material in their neighborhood, where in fact they are no more capable of seeking out material to consume than any other gravitational attractor. As with any mass in the universe, matter must come within its gravitational scope for the possibility to exist of capture or consolidation with any other mass. Equally common is the idea that matter can be observed falling into a black hole. This is not possible. Astronomers can detect only accretion disks around black holes, where material moves with such speed that friction creates high-energy radiation which can be detected (similarly, some matter from these accretion disks is forced out along the axis of spin of the black hole, creating visible jets when these streams interact with matter such as interstellar gas or when they happen to be aimed directly at Earth). Furthermore, a distant observer will never actually see something reach the horizon. Instead, while approaching the hole, the object will seem to go ever more slowly, while any light it emits will be further and further redshifted. In cosmology, the event horizon of the observable universe is the largest comoving distance from which light emitted now can ever reach the observer in the future. This differs from the concept of particle horizon, which represents the largest comoving distance from which light emitted in the past could have reached the observer at a given time. For events beyond that distance, light has not had time to reach our location, even if it were emitted at the time the universe began. How the particle horizon changes with time depends on the nature of the expansion of the universe. If the expansion has certain characteristics, there are parts of the universe that will never be observable, no matter how long the observer waits for light from those regions to arrive. The boundary past which events cannot ever be observed is an event horizon, and it represents the maximum extent of the particle horizon. In this equation, a is the scale factor, c is the speed of light, and t0 is the age of the Universe. If dp → ∞ (i.e., points arbitrarily as far away as can be observed), then no event horizon exists. If dp ≠ ∞, a horizon is present. Examples of cosmological models without an event horizon are universes dominated by matter or by radiation. An example of a cosmological model with an event horizon is a universe dominated by the cosmological constant (a de Sitter universe). A calculation of the speeds of the cosmological event and particle horizons was given in a paper on the FLRW cosmological model, approximating the Universe as composed of non-interacting constituents, each one being a perfect fluid. 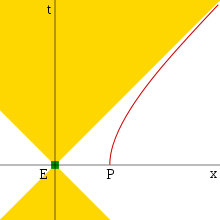 Spacetime diagram showing a uniformly accelerated particle, P, and an event E that is outside the particle's apparent horizon. The event's forward light cone never intersects the particle's world line. If a particle is moving at a constant velocity in a non-expanding universe free of gravitational fields, any event that occurs in that Universe will eventually be observable by the particle, because the forward light cones from these events intersect the particle's world line. On the other hand, if the particle is accelerating, in some situations light cones from some events never intersect the particle's world line. Under these conditions, an apparent horizon is present in the particle's (accelerating) reference frame, representing a boundary beyond which events are unobservable. For example, this occurs with a uniformly accelerated particle. A spacetime diagram of this situation is shown in the figure to the right. As the particle accelerates, it approaches, but never reaches, the speed of light with respect to its original reference frame. On the spacetime diagram, its path is a hyperbola, which asymptotically approaches a 45-degree line (the path of a light ray). An event whose light cone's edge is this asymptote or is farther away than this asymptote can never be observed by the accelerating particle. In the particle's reference frame, there appears to be a boundary behind it from which no signals can escape (an apparent horizon). While approximations of this type of situation can occur in the real world (in particle accelerators, for example), a true event horizon is never present, as this requires the particle to be accelerated indefinitely (requiring arbitrarily large amounts of energy and an arbitrarily large apparatus). A misconception concerning event horizons, especially black hole event horizons, is that they represent an immutable surface that destroys objects that approach them. In practice, all event horizons appear to be some distance away from any observer, and objects sent towards an event horizon never appear to cross it from the sending observer's point of view (as the horizon-crossing event's light cone never intersects the observer's world line). Attempting to make an object near the horizon remain stationary with respect to an observer requires applying a force whose magnitude increases unboundedly (becoming infinite) the closer it gets. In the case of a horizon perceived by a uniformly accelerating observer in empty space, the horizon seems to remain a fixed distance from the observer no matter how its surroundings move. Varying the observer's acceleration may cause the horizon to appear to move over time, or may prevent an event horizon from existing, depending on the acceleration function chosen. The observer never touches the horizon and never passes a location where it appeared to be. In the case of a horizon perceived by an occupant of a de Sitter universe, the horizon always appears to be a fixed distance away for a non-accelerating observer. It is never contacted, even by an accelerating observer. In the case of the horizon around a black hole, observers stationary with respect to a distant object will all agree on where the horizon is. While this seems to allow an observer lowered towards the hole on a rope (or rod) to contact the horizon, in practice this cannot be done. The proper distance to the horizon is finite, so the length of rope needed would be finite as well, but if the rope were lowered slowly (so that each point on the rope was approximately at rest in Schwarzschild coordinates), the proper acceleration (G-force) experienced by points on the rope closer and closer to the horizon would approach infinity, so the rope would be torn apart. If the rope is lowered quickly (perhaps even in freefall), then indeed the observer at the bottom of the rope can touch and even cross the event horizon. But once this happens it is impossible to pull the bottom of rope back out of the event horizon, since if the rope is pulled taut, the forces along the rope increase without bound as they approach the event horizon and at some point the rope must break. Furthermore, the break must occur not at the event horizon, but at a point where the second observer can observe it. Observers crossing a black hole event horizon can calculate the moment they have crossed it, but will not actually see or feel anything special happen at that moment. In terms of visual appearance, observers who fall into the hole perceive the black region constituting the horizon as lying at some apparent distance below them, and never experience crossing this visual horizon. Other objects that had entered the horizon along the same radial path but at an earlier time would appear below the observer but still above the visual position of the horizon, and if they had fallen in recently enough the observer could exchange messages with them before either one was destroyed by the gravitational singularity. Increasing tidal forces (and eventual impact with the hole's singularity) are the only locally noticeable effects. Tidal forces are a function of the mass of the black hole. In realistic stellar black holes, spaghettification occurs early: tidal forces tear materials apart well before the event horizon. However, in supermassive black holes, which are found in centers of galaxies, spaghettification occurs inside the event horizon. A human astronaut would survive the fall through an event horizon only in a black hole with a mass of approximately 10,000 solar masses or greater. The description of event horizons given by general relativity is thought to be incomplete. When the conditions under which event horizons occur are modeled using a more comprehensive picture of the way the Universe works, that includes both relativity and quantum mechanics, event horizons are expected to have properties that are different from those predicted using general relativity alone. At present, it is expected that the primary impact of quantum effects is for event horizons to possess a temperature and so emit radiation. For black holes, this manifests as Hawking radiation, and the larger question of how the black hole possesses a temperature is part of the topic of black hole thermodynamics. For accelerating particles, this manifests as the Unruh effect, which causes space around the particle to appear to be filled with matter and radiation. According to the controversial black hole firewall hypothesis, matter falling into a black hole would be burned to a crisp by a high energy "firewall" at the event horizon. An alternative is provided by the complementarity principle, according to which, in the chart of the far observer, infalling matter is thermalized at the horizon and reemitted as Hawking radiation, while in the chart of an infalling observer matter continues undisturbed through the inner region and is destroyed at the singularity. This hypothesis does not violate the no-cloning theorem as there is a single copy of the information according to any given observer. Black hole complementarity is actually suggested by the scaling laws of strings approaching the event horizon, suggesting that in the Schwarzschild chart they stretch to cover the horizon and thermalize into a Planck length-thick membrane. A complete description of event horizons is expected to, at minimum, require a theory of quantum gravity. One such candidate theory is M-theory. Another such candidate theory is loop quantum gravity. ^ The set of possible paths, or more accurately the future light cone containing all possible world lines (in this diagram represented by the yellow/blue grid), is tilted in this way in Eddington–Finkelstein coordinates (the diagram is a "cartoon" version of an Eddington–Finkelstein coordinate diagram), but in other coordinates the light cones are not tilted in this way, for example in Schwarzschild coordinates they simply narrow without tilting as one approaches the event horizon, and in Kruskal–Szekeres coordinates the light cones don't change shape or orientation at all. ^ Chaisson, Eric (1990). Relatively Speaking: Relativity, Black Holes, and the Fate of the Universe. W. W. Norton & Company. p. 213. ISBN 978-0393306750. ^ Bennett, Jeffrey; Donahue, Megan; Schneider, Nicholas; Voit, Mark (2014). The Cosmic Perspective. Pearson Education. p. 156. ISBN 978-0-134-05906-8. ^ Brill, Dieter (2012). "Black Hole Horizons and How They Begin". The Astronomical Review. 7 (1): 25–35. Bibcode:2012AstRv...7a..25B. doi:10.1080/21672857.2012.11519694. Retrieved 1 September 2012. ^ Margalef Bentabol, Berta; Margalef Bentabol, Juan; Cepa, Jordi (21 December 2012). "Evolution of the cosmological horizons in a concordance universe". Journal of Cosmology and Astroparticle Physics. 2012 (12): 035. arXiv:1302.1609. Bibcode:2012JCAP...12..035M. doi:10.1088/1475-7516/2012/12/035. ^ Margalef Bentabol, Berta; Margalef Bentabol, Juan; Cepa, Jordi (8 February 2013). "Evolution of the cosmological horizons in a universe with countably infinitely many state equations". Journal of Cosmology and Astroparticle Physics. 015. 2013 (2): 015. arXiv:1302.2186. Bibcode:2013JCAP...02..015M. doi:10.1088/1475-7516/2013/02/015. ^ Misner, Charles; Thorne, Kip S.; Wheeler, John (1973). Gravitation. W. H. Freeman and Company. p. 824. ISBN 978-0-7167-0344-0. ^ "Journey into a Schwarzschild black hole". jila.colorado.edu. ^ "Dive into the Black Hole". casa.colorado.edu. ^ Hobson, Michael Paul; Efstathiou, George; Lasenby, Anthony N. (2006). "11. Schwarzschild black holes". General Relativity: An introduction for physicists. Cambridge University Press. p. 265. ISBN 978-0-521-82951-9. Kip Thorne (1994). Black Holes and Time Warps. W. W. Norton. Abhay Ashtekar and Badri Krishnan, “Isolated and Dynamical Horizons and Their Applications”, Living Rev. Relativity, 7, (2004), 10; Online Article, cited Feb.2009.